When I was little, my mother use to tell me “the best things in life are worth waiting for.” I think it was her way of helping me deal with disappointments in life. Those words came back to me last Sunday when I finished the Berlin Marathon. It was delayed a year but my trip, my race were incredible and worth the wait. In 2014 I planned to run this race with the goal of completing it under 5 hours. When my broken arm forced a race delay, I decided to run the race this year but forget about the time goal. I was going to run this one just for the adventure. Honestly, in the back of my mind, I never entirely let go of that goal. If there was any place where I could get a sub-5 hour marathon, it would be in Berlin. The last six world records for the men’s marathon have been set at the Berlin Marathon, most recently in 2014 when Dennis Kimetto finished in 2:02:57. Berlin offers the ideal conditions for a marathon. The course is about as flat as you can get. Temperatures on race day are typically between 53 – 64 degrees with very little wind – perfect for marathoners, especially ones like me with Transverse Myelitis. 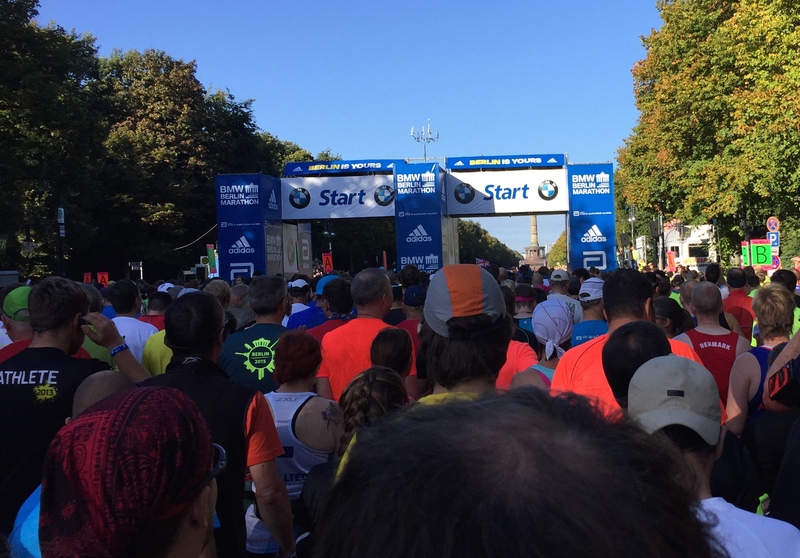 Except for the cobblestones around the Brandenburg Gate, the course is asphalt so not as painful on the joints. The Expo was held at the old Tempelhof Airport. It was probably one of the most lively Expos I have ever seen – lots of people, loud music, and vendors for everything a runner could ever dream of wanting. 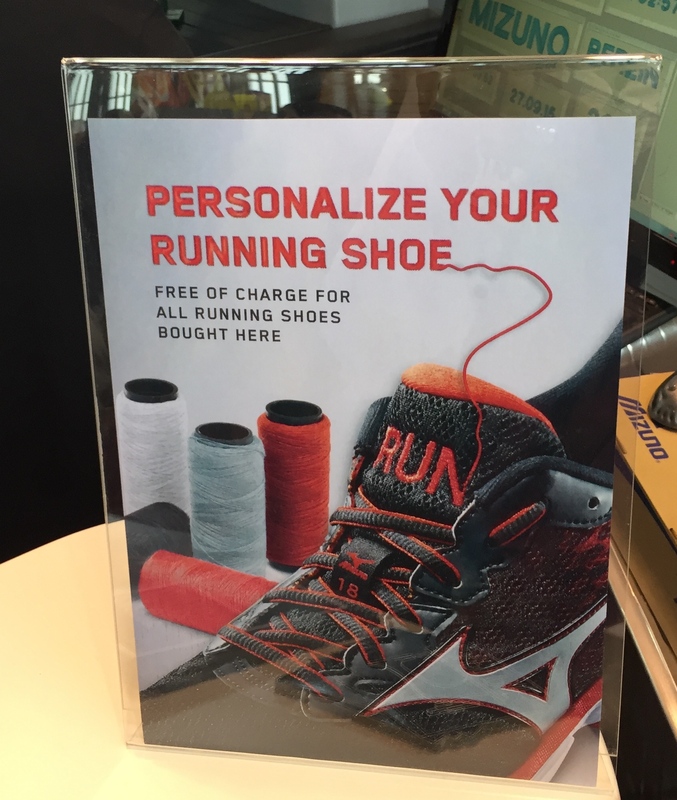 One thing that surprised me was a Mizuno booth where you could buy running shoes and have them personalized. I have never seen that in the US. In addition to the marathon, there were several other events during the weekend. I ran in the International 6K Breakfast Run on Saturday morning. The run was a great way to deal with my pre-race nerves as well as get an idea of what the weather would be like for the marathon. There was no registration for this race but they estimated that 10,000 runners took part. Runners were encouraged to wear colors or costumes reflective of their native country or city. Some of them got pretty crazy. I saw a guy running in a Waldo costume (as in Where’s Waldo?). There was a group from Sweden that was cheering as they ran through the streets. If the Summer Olympics had a fun run, it would look like this. The run started at Charlottenburg Palace and ended on the track inside the Olympic Stadium where Jesse Owens won four gold medals in the 1936 Olympics. When I headed out for the pasta dinner on Saturday, I saw the tail end of the Inline Skating Marathon. Over 5,500 skaters raced on the same marathon course I was running the next day. Those skaters were really flying too. The winner finished the skating marathon in 56 minutes. There were lots of events for kids on Saturday. They held the Bambini 500 meter/1000 meter races for kids aged 10 and under on the tarmac of Tempelhof Airport. Over 1,500 kids were entered in those. Over 10,000 grammar school and elementary school kids ran in the Mini-marathon whose course followed the last 4.2K of the marathon course. For budding inline skaters, there was a kids (aged 6-13) version of the Inline Skating event but with distances of between 500 and 3000 meters (based on age and skill level). Nobody can say the kids in Germany aren’t moving enough! But the weekend was all about Sunday and the marathon. Over 41,000 runners from 127 nations were entered. We were packed in our corral like sardines. Everyone was happy and nervous. I was chatting with all the runners around me as we waited for the start. The race started at 9 AM but our corral didn’t get to cross the start line until 9:38. I like to do some sightseeing as I run a marathon but the course was so crowded, I had to pay attention to where I was running. I didn’t want to trip over anything. Unfortunately, around Mile 7, I twisted my ankle in a pothole. I kept going, hoping it would work itself out. It bothered me for the rest of the race. I also didn’t spend time taking pictures because I was there for a reason. I wanted a PR and stopping to take pictures wasn’t going to help me get it. Water stops were interesting. This was the first race I ran where they used plastic cups for the water and sports drinks. With the number of runners in the race, you can imagine how many cups were all over the road. It was tough to run through them – runners were kicking them all over the place and the cups were slippery. There was a sponge in the goody bag that runners received at the Expo with their bib. The sponge was intended for cooling off during the race. There were tubs of water at some water stops to dip the sponge in. I didn’t see many runners with their sponges. I didn’t carry mine so I used my homemade tube sock arm warmers to cool off. The Berlin Marathon is one of the six World Major Marathons. I have this notion that a major marathon is suppose to be more serious. I don’t expect to see people dressed in costumes, for example. But there were a few that caught my eye. I saw a guy running dressed as a bottle of Erdinger alcohol-free beer, another dressed as a wurst (a German sausage), and another dressed as a Minion. I tried to beat the beer bottle guy but he pulled ahead of me at Mile 20 and I couldn’t catch him. I am pretty sure the wurst guy finished ahead of me too. Along the course there was lots of entertainment and cheering crowds. The atmosphere helped to keep my adrenaline flowing. Despite the nagging pain in my ankle, I just kept running. I felt relaxed and strong. It was thrilling to run through the Brandenburg Gate to the finish line. The crowds there were huge. The grandstands were free to anyone who wanted to use them and they were packed with cheering people. When I stopped my Garmin after crossing the finish line, it flashed “New Personal Record Marathon” and showed my time. I had finished in 4 hours and 50 minutes. Probably the most startling thing that I saw after the race was a woman runner sitting on the ground, wrapped in her space blanket and wearing her finishers medal. She was smoking a cigarette. I was amazed. I have never seen a runner who smokes. 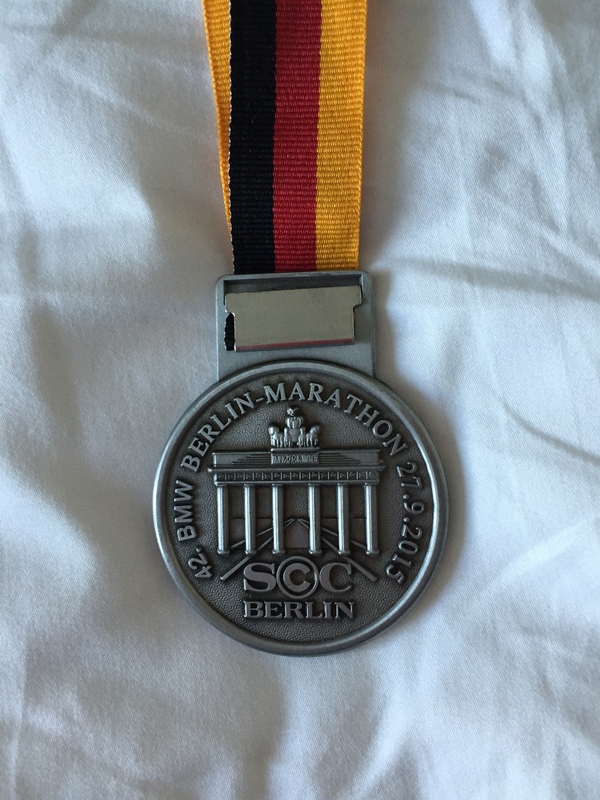 The Berlin Marathon was everything that I hoped it would be and more. Yes, Mom was right again. The best things in life are worth waiting for. It took me two years but I got there and earned the PR that I wanted. At one point in the race, I saw a woman running ahead of me wearing a shirt that said “PowerFrau”. It translates to SuperWoman. Thinking about how I did – running with a twisted ankle in sub-5 hours – I’d say that I am a PowerFrau too.